People in hockey talk a lot about the “systems” that a team plays. Phrases like – “I don’t think their systems fit their personnel” or “Their systems aren’t effective” or “We play an up-tempo and offensive system”. I think too often people use systems as a catch-all buzzword to describe a teams play. What people really should be talking about is a teams style of play. Are they aggressive or passive? Attacking or defensive? Do they like to play a grinding game? A transition/rush game? Are they skilled and fast? Big and strong? A team’s systems will then make up part of their style. What their forecheck, dzone coverage, etc is composed of helps to ingrain a style of play into a players mind. Players make decisions on the ice more under the umbrella of a team’s style than their x’s & o’s systems. Aggressive teams will have players who step up more often in 50/50 situations. 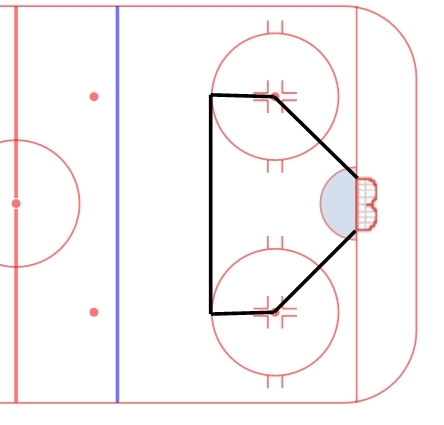 Defensive or passive teams will tend to back off and protect the middle of the ice through the dot lines. These are stylistic decisions, not systems decisions. Coaches establish the system a team will play, but more importantly they establish the style that will guide the individual decisions that players will make all over the ice. This weekend, there were 12 games played in the NCAA Division I Men’s Hockey Tournament. Those 12 games resulted in four regional champions that are heading to Boston for the Frozen Four. I had suspected prior to doing this research that a good majority of goals were scored after a failed clear. While it is a very small sample size, about 65% of goals scored in the offensive zone come after a failed clear. I was surprised with the high number of rush goals – having half of the goals scored at even strength be off the rush is a surprisingly high number. I am not surprised that the number of goals after a lost battle is very high. Often teams that maintain possession do so as a result of winning puck races and 1v1 battles – the longer you possess the puck, the more fatigue sets in and the higher your chances of scoring. Turnovers in the defensive zone are especially damning as well – 57% of goals scored off off OZ possession come after a turnover. The number of goals scored that beat the goaltenders clean was surprising. Over 25% were shots that beat a goaltender that was set on the shot. More on par with expectations was the number of goals after a pass and off of rebounds. It is a small sample size, but it is very interesting to look at and see how goals are scored in the biggest games in Division I hockey. Bottom line – execute your clears, don’t turn the puck over and limit possession time in the offensive zone for your opponent…things that all good coaches preach on a regular basis. There are many ways to measure performance in a game – eye test, scoresheet, standard metrics, advanced metrics, etc. To me, the best indicator of overall performance is Scoring Chances. We define a scoring chance as any shot on net from within the “scoring area” (inside the dots and below the tops of the circles).Statistically speaking, NHL goalies have a .855 save percentage inside the scoring area, and a .958 save percentage outside of it (reference: http://www.hockeybuzz.com/blog/Ryan-Wilson/Home-Plate-Save-Percentage/177/62065). Any shot from within the “scoring area” has a much greater chance of beating the goaltender. Why do I consider this the best indicator of performance? Critical moments. Scoring chances are the critical moments in any game that dictate the outcome. There are thousands of innocuous plays in every hockey game, but only about 20-40 that qualify as a scoring chance. How you perform in these instances says a lot about how you played the game. How do we measure scoring chances? After every game, I go through and watch every shot for and against. The shots that are released from within the scoring area are recorded as scoring chances. I then record responsibility for each chance – for and against. This is the subjective part of scoring chances, sometimes it is hard to say who is more responsible for a certain play. We assign primary and secondary responsibility for every play – the difference between primary and secondary is sometimes marginal, but there are almost always at least two players who could have changed the outcome of the play. I don’t look at primary vs secondary very often, mostly overall scoring chance +/- (your involvement in chances for minus your involvement in chances against). We also measure a stat called absolute scoring chances. Absolute scoring chances measures the number of chances for and against while you were on the ice, regardless of involvement in the play. This indicates if a player, line, d pair is more of a positive or negative influence on the game overall. I also feel this is a good indicator of matchups – if you were playing against an opponents top line and were even or better in absolute scoring chances, that is a good game. 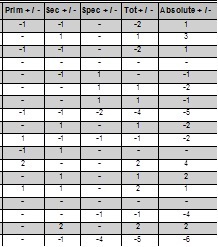 Total +/- indicates a player’s involvement (primary or secondary) in scoring chances. Absolute +/- is their on ice presence for any even strength scoring chance. In this game, two players had poor performances (-4 and -5 total) while a few (the +2s total and +3 and +4 absolute) had good performances. While there is always a big picture evaluation, scoring chances gives you a snapshot of who was involved and who influenced the game in a positive or a negative manner. Teaching through scoring chances gives you an opportunity to improve your performance in the critical moments that define a hockey game. There are two ways to win a hockey game – taking advantage of mistakes and taking what is given to you, or imposing your will and dictating the outcome. Both ways work and both are effective, but to be a successful team you have to be able to do both. Beating average or below-average teams requires you to be able to take advantage of mistakes. A good team will make you have to fight for every inch of ice and make you work to impose your will. Often, you can play a sound structural game, make good decisions and score a few goals – this is a general philosophy for winning hockey games. If you capitalize on your opportunities and have fewer unforced errors than the other team, you will generally win the game. Against high end teams, this isn’t enough. Making good decisions and playing sound structurally isn’t good enough to win a game. You have to compete for every inch of ice and look to impose your will on the other team. What does this look like? Body position. All over the ice you have to fight for positioning – competing for the space that you need to make plays and generate offence. You have to know when to try to make plays and when to live to fight another day. You have to possess the puck and value the times when you do have it. Above all else, you have to own the ice in front of the blue paint. Against good teams, it isn’t enough to simply clear the puck, you need to put it in a place where you can go forecheck it. You need to make sound decisions when you have the puck so you can maintain possession. You need to set yourself up for success on the next shift and the shift after. Good teams will create battles where every shift, every inch of ice is valued. Every opportunity for possession is one that must be taken advantage of. They make you work for every opportunity you have. Execution in critical moments is even more important, as those moments are much fewer in quantity. Want to be a good team? Make simple plays. Possess the puck. Own the ice in front of the crease. Make your opponent work for and earn everything they get – don’t give them anything. Teams that do that are hard to play against and force their opponents to play a near perfect game to leave with two points. A half-ice team drill this week. 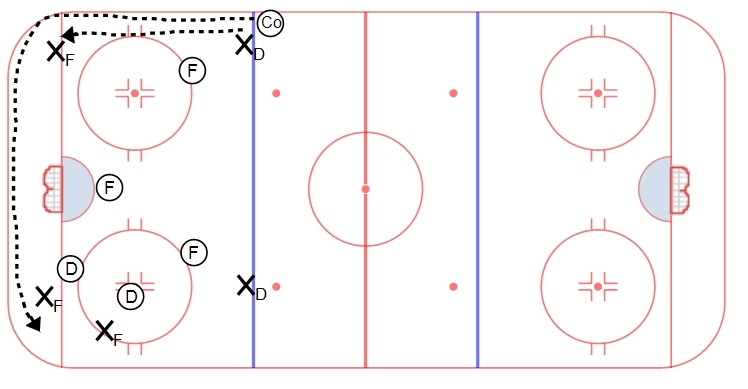 This is a situational defensive play drill used to practice D-Zone play. The drill starts with a puck rimmed in to the far side. Two forwards and one defenseman are on offense (X’s), while two D and two F’s (O’s) defend. On the whistle, the coach plays a puck to the down low forward on the other side of the ice. Now it becomes 5v5 in zone, with the four defensive players changing sides and the three offensive players resetting and joining the play. This drill works on two critical elements of play in zone – keeping opponents on the perimeter and pucks changing sides. In zone, pucks changing sides of the ice can create some of the best opportunities for the offensive side. The defensive team has to change their alignment, move to new positions and survey the new scene. Training your team on how to react and how to play these situations will get them more comfortable when this happens in a game. On the offensive side, it helps your players with playing pucks on the wall, finding creative options (using the point), protecting the puck in outnumbered situations and quick attacks when the puck changes sides. As an offensive player, when the puck changes sides is your critical moment to attack. You should instantly look to beat your man to the net and create an offensive opportunity. Seize the moment of confusion for the defense and take advantage. Do you build a system to fit your players or do you get players to fit your system? Sounds a little like chicken vs egg to me. When building a system of play for your team, it is critical that the players on your roster have an ability to play that system. For example, don’t play a system predicated on a high level of hockey sense if you have very little hockey sense on your roster. Similar ideas with other systems as well – don’t utilize a speed based, north/south system with a slow roster, etc. At the same time, you should have a system of play that you believe is more successful than others and you should attempt to build your roster to fit this system. If you like to play an offensive cycle game, you should build your roster with big and strong forwards who can use their body to possess the puck down low. If your breakout is based upon defensemen who can skate and make quick puck decisions, you should have those types of players on your team. The bottom line is that you need to use a little of both when determining what type of system to play. Figure out what you like and how you want to play the game and then tweak it to fit your personnel. The best coaches are the ones who can adapt their system to fit the team they have while at the same time trying to build the team they want.